The first Space-Based Space Surveillance (SBSS) satellite was launched on Saturday. It is an Air Force satellite that gives the U.S. a new eye in the sky. Oddly, many of the reports about the satellite suggest its key role is tracking debris, and suggest that it will be useful for tracking debris in low Earth orbit (LEO, at altitudes below 2,000 km). For example, in discussing its debris mission some articles refer to the debris created by the January 2007 Chinese anti-satellite “experiment” and the February 2009 collision between an inactive Russian Cosmos satellite and an operating commercial Iridium satellite. Both of these events took place at 800 to 900 km altitude. But SBSS was originally intended for detecting and tracking space objects in the geosynchronous belt (GEO, at an altitude of 36,000 km) and other deep space orbits – not LEO. And while the U.S. is interested in keeping track of objects in GEO to protect satellites from possible threats, debris in GEO does not pose the same threat to satellites as debris in LEO. In LEO, satellites are threatened by debris in crossing orbits. In that case the relative speed of a satellite and debris in a collision would be very high – typically around 10 km/s – so that even debris a centimeter or less in size can damage or disable a satellite. But in the GEO belt, objects travel in essentially the same direction so that the relative speed between objects is much less than their orbital speed. As a result, collisions are much less damaging. It appears that the real interest of the military is having the ability to track objects in GEO and deep space orbits at any time. This would allow, for example, nearly continuous tracking of an object of particular interest that may be maneuvering, or of an unknown object to see if it may start to maneuver. Since debris would not be maneuvering, known debris particles don’t require this kind of continuous tracking. SBSS is a one-ton satellite that orbits at 630 km altitude in a nearly polar (sun synchronous) orbit, and carries a 30-cm aperture telescope with a visible-light sensor. 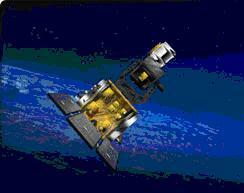 Currently, the United States uses two main types of sensors to track objects in space: radars and optical telescopes. Radars track objects by sending out pulses and detecting the pulses that are reflected from the object. Radars have the advantage that the pulses pass through clouds so they can operate in all weather conditions, and since they don’t rely on reflected sunlight they can be used night or day. Large, powerful, phased-array radars (as well as a radar “fence” across the southern U.S) are used for tracking both satellites and space debris in orbits up to altitudes of about 6,000 km. However, the detection and tracking capabilities of these radars decrease rapidly with the distance to the target (as the fourth power of the distance). They can reliably detect small objects in LEO – down to 5 to 10 cm in diameter – but can have difficulty tracking even large objects in GEO. For this reason, the United States uses optical sensors, which detect reflected sunlight, to track objects in GEO and deep-space orbits. These sensors can detect objects in GEO that are somewhat smaller than a meter in size, and can therefore track operational satellites and large pieces of debris. However, these optical sensors are all ground-based (in Hawaii, New Mexico, and Diego Garcia in the Indian Ocean), can only operate in clear weather and at night, and each site can only view part of the GEO belt. The SBSS system is intended to provide a capability to observe any point in GEO at any time. Since it is above cloud cover, its optical sensors are not limited by weather. A single SBSS satellite would be able to see the entire GEO band twice an orbit – about every 45 minutes – when it was over the poles, but would have its view of up to one-third of the GEO band blocked by the Earth between those times. A constellation of four satellites, which has been discussed for the future, would put at least one in position to see an object in any part of GEO at any time. SBSS builds on the success of the Spaced-Based Visible (SBV) sensor package on the on the Mid-Course Space Experiment (MSX); SBV was basically a smaller version of the SBSS sensor. The primary experiment on MSX was an infrared sensor, but it was short-lived since it depended on a block of solid nitrogen for cooling, and stopped working when that disappeared. For many years after that, SBV was the only functioning instrument on the MSX satellite. The effectiveness of the SBV sensor on the MSX was limited by the fact that its telescope was rigidly mounted, so the entire MSX satellite had to rotate to aim the SBV telescope. Despite this limitation, SBV provided thousands of tracks of GEO objects from 1996 to 2008 and was generally regarded as establishing the viability of a space-based tracking system. It was shut down in May 2008, well past its expected lifetime. The SBSS sensor is significantly more capable than SBV, since its sensor can swivel to allow rapid re-pointing without rotating the satellite, and it has a larger aperture (30 cm vs 15 cm), which allows it to detect fainter objects than SBV. However, this is much smaller than, for example, the 2.4 m aperture on the Hubble Space Telescope. Putting sensors in space in order to track objects in GEO and beyond in any weather and at any time of day may be a useful aspect of “space situational awareness,” but it comes at a cost. On the one hand, the SBSS mission costs nearly $1 billion. In addition, sensors that are small enough to launch into space are much smaller than ground-based sensors, so that ground-based sensors are more sensitive and are able to detect and track much dimmer objects. As a result, SBSS will not give the U.S. the capability to detect and track any objects that it can’t see already. As a result, claiming that SBSS will “revolutionize” the Air Force’s ability to track objects in space, as an Air Force official stated, sounds a bit exaggerated. And the claim from a Boeing fact sheet that “The SBSS system will revolutionize the nation’s Space Situational Awareness by detecting and monitoring dimmer, most distant objects than ever before” is simply not true.